I recently traveled to Atlanta with my nieces and nephews to see an NBA game, which was a totally fun experience and I highly recommend it if you have a chance to see one. We stayed overnight in downtown Atlanta after the game and decided to do a little sight-seeing in the morning before returning home. 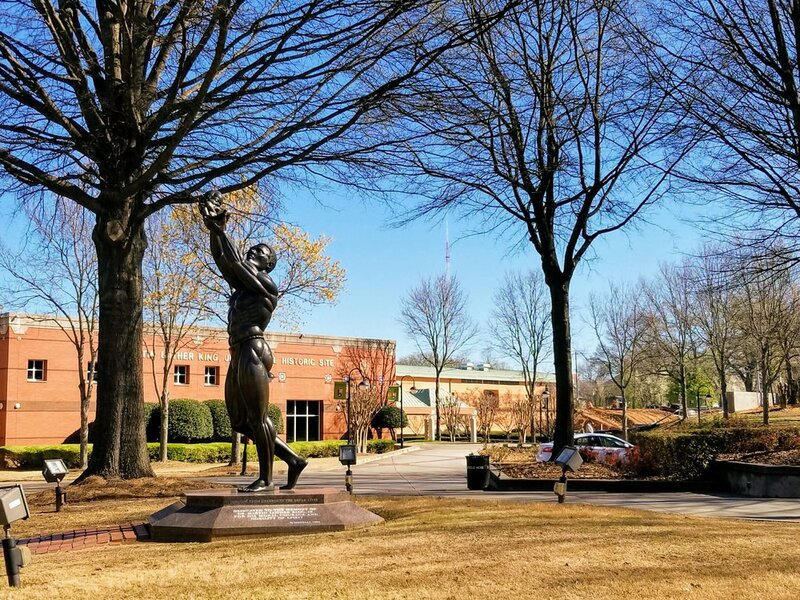 Atlanta offers a plethora of activities, especially downtown, but we ultimately settled on the Martin Luther King Jr. National Historic Park. 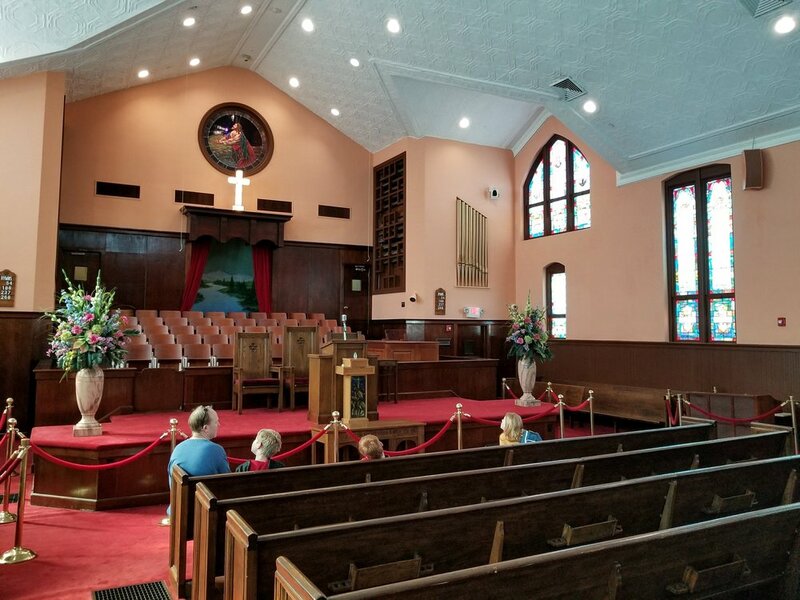 My nephew had recently done a book report on MLK for school so it was a perfect opportunity to visit his birthplace and the church where he preached. The Park was an excellent adventure, full of interesting immersive experiences, thought- provoking displays, and beautiful grounds for the kids to run a little bit. I would highly recommend it to anyone traveling to Atlanta with kids of any age as there was something for everyone to enjoy. 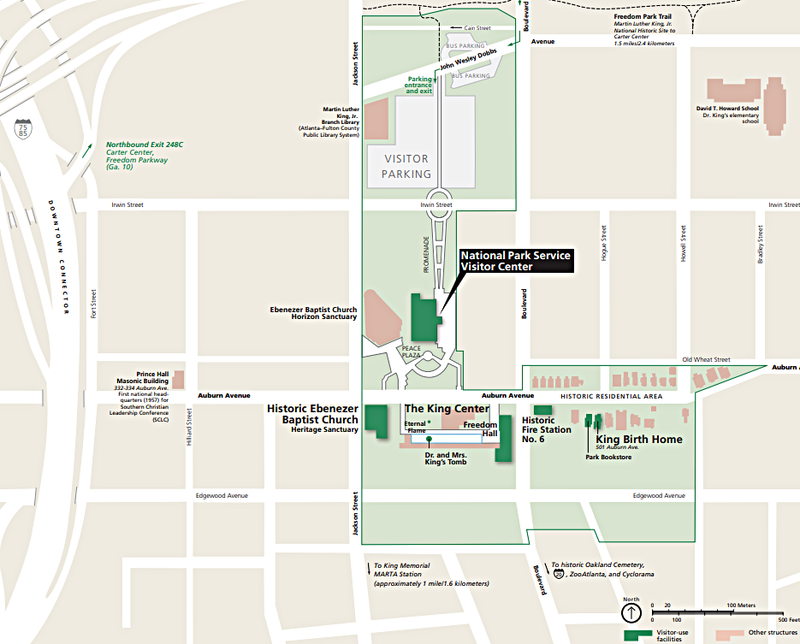 The Park spreads several blocks and includes the Visitor Center, Ebenezer Church, The King Center, Fire House No. 6, and MLK's birth home. There are informational plaques along the sidewalks telling you about the neighborhood and the different historic structures located within the park. The NPS has bought and restored many of the houses around his birth home, giving you a feel for how the neighborhood would have looked as MLK knew it. Many of these surrounding homes are private residences with people living there, lending a feel of continuity and liveliness to the area instead of being frozen in time. Behold Monument in front of the Visitor Center of the Martin Luther King Jr National Historic Site. Start your tour at the Visitor Center. 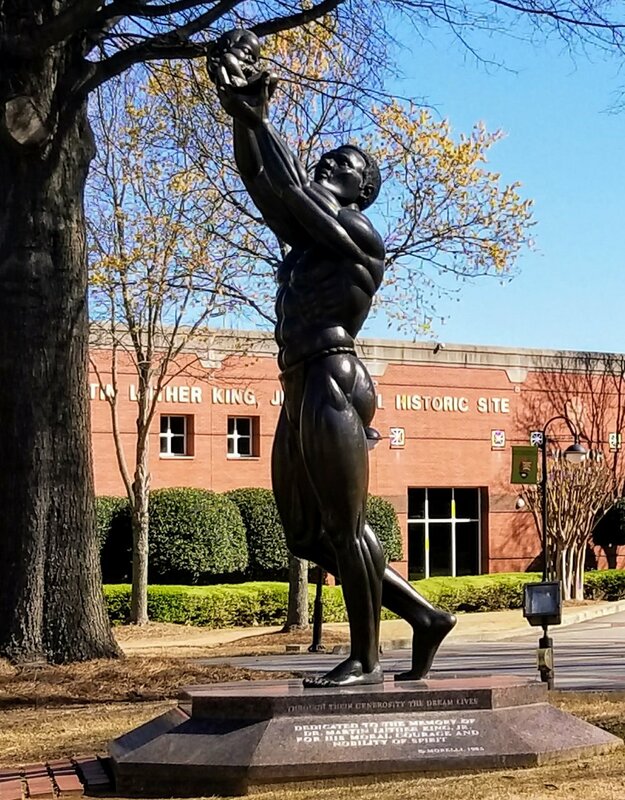 If you are walking from the streetcar stop at King Historic District, you will first pass the Behold Monument, a large sculpture of a man holding a baby up to the sky. Take a moment to read the sculptor's statement on the NPS website as it helped me see much more of the sculpture's symbolism that I otherwise would have missed. The World Peace Rose Garden, besides being beautiful, features poems about peace written by schoolchildren around the globe. The kids enjoyed reading them all and picking their favorite. You will pass by the garden as you make your way to the entrance of the Visitor Center. The public parking lot is behind the Visitor Center as well as a statue of Gandhi, an important source of inspiration for Martin Luther King Jr. and his commitment to non-violence. Also behind the Visitor Center is a nice, new playground that would be an excellent place for a break after touring. Emulating the civil rights marchers on "Freedom Road"
The main exhibit, "Courage To Lead," tells the story of MLK and the Civil Rights Movement. Each circular display area contains videos, pictures, and informational plaques and it was well put together. The kids' interest was held more than I usually see in museums. We particularly liked the "Children of Courage" exhibit which is geared to kids and has tactile components, like drawers to open and flaps to lift. The kids also liked "Freedom Road" where you could join the marchers on the road to Civil Rights. You can also view video presentations in the small theatre. We didn't stay for one as the kids wanted to move on to see the other buildings. But a great option for rainy or sweltering days. *Simply Awesome Tip: Be sure to get Junior Ranger Booklets from the information desk in the Visitor Center. They are full of activities that the kids enjoyed filling out. When completed and stamped by a ranger, you receive a Junior Ranger pin. I liked the booklets because it gave the kids something to do when we periodically stopped for a break. 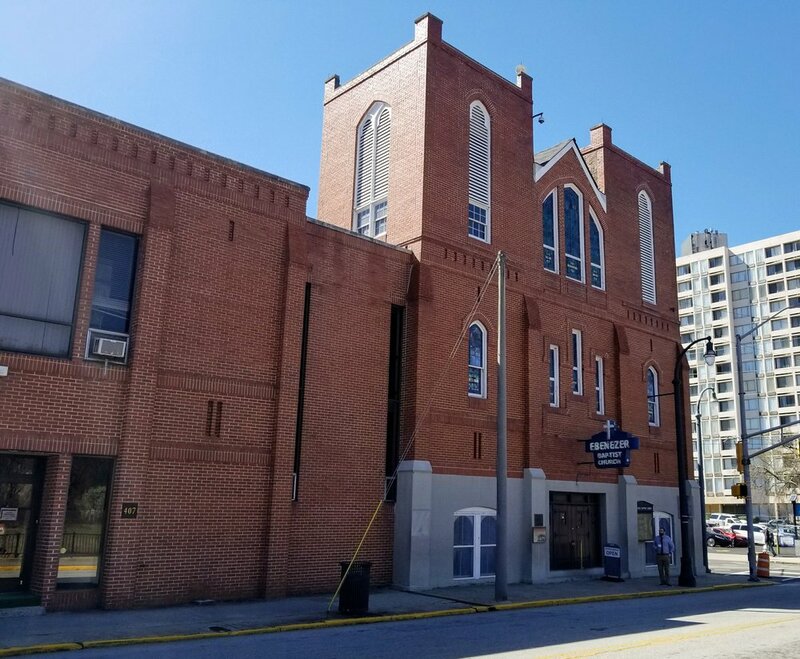 After touring the Visitor Center, cross Auburn Ave and enter Historic Ebenezer Baptist Church. Martin Luther King, Sr. was a minister of this church and his son, Martin Luther King Jr, was baptized here before growing up to be a co-pastor of the church, alongside his father. Sit in the pews and listen to one of MLK's sermons while the kids complete their Junior Ranger booklets. Martin Luther King Jr. really was an impressive speaker. Ebenezer Church was my favorite stop, and we sat and listened to his sermon for about 15 min. From Ebenezer Church, walk next door to the King Center. 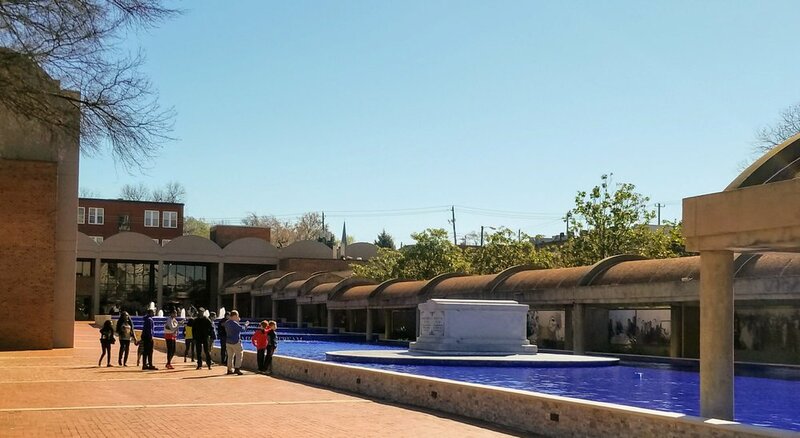 You will first walk through the plaza and reflecting pond surrounding the crypts of Martin Luther King, Jr. and Coretta Scott King. Stop and read the Six Principles of Nonviolence engraved on the wall as you enter the plaza. The Eternal Flame burns opposite the final resting places of the Kings which I thought was a very nice bit of symbolism. The kids were far more taken with the practical aspects of the flame, peppering me with questions about what happens when it rains or if someone dumps a bucket of water on the flame, etc. The King Center is the building at the far end of the plaza and contains 3 small exhibits upstairs, focusing on personal effects of Martin Luther and Coretta Scott King, Mahatma Gandhi, and Rosa Parks. 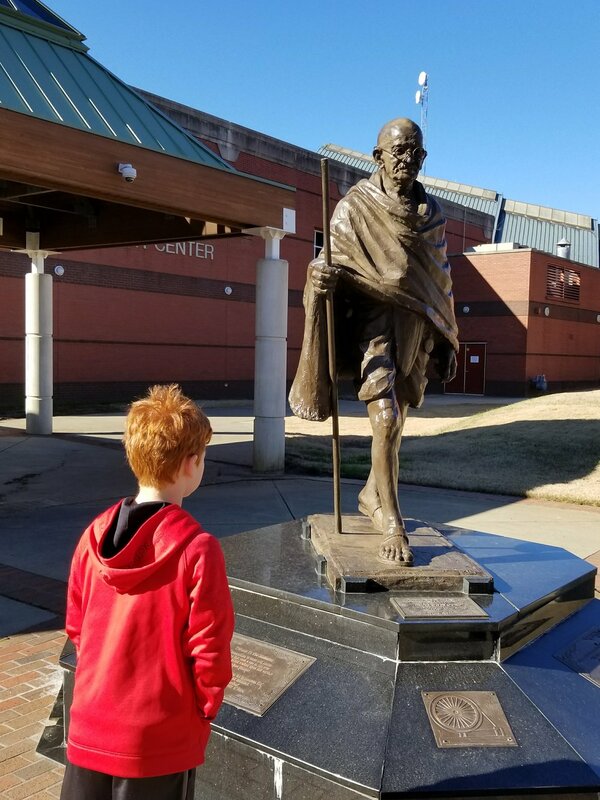 If you are beat and need to skip something, this would probably be it--although my 8 year old nephew said the exhibit on Gandhi was his favorite thing. There is a gift shop, water fountain, and restrooms on the ground floor of the King Center. Turn right onto Auburn Ave from the King Center and cross Boulevard. 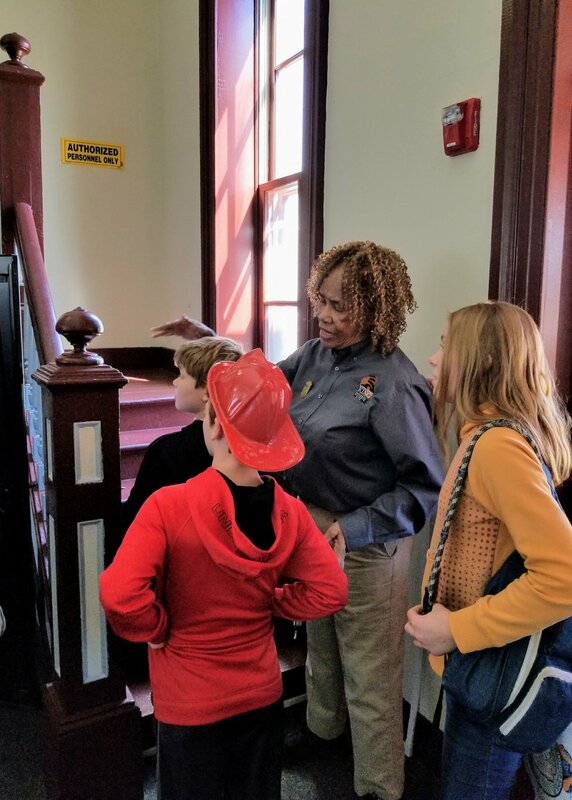 You'll find exhibits on the history of the Atlanta fire department and its desegregation in 1963. The best thing about the visit was Sunshine, a national park service volunteer, who enthusiastically shared stories about Martin Luther King. Sunshine was one of my favorite park volunteers that I have ever met. There was a "touch table" in the station containing objects relating to segregation and Martin Luther King Jr. Sunshine gathered a group of people and gave almost everybody something to hold. She then told a story about each object, whether it was looking up your town in the "Green Book" to see where you could stay or eat, or guessing the number of marbles in a jar to see if you could vote. The kids were fascinated and it brought history home to them in a very personal way. Birth Home Of Martin Luther King Jr.
From the Fire Station, turn right and continue up Auburn Ave to the home of Martin Luther King Jr's parents and grandparents. We were unable to go inside the house, but it was a pretty walk around the outside and along the sidewalks in the neighborhood. The surrounding houses have been bought and restored by the NPS, and there are informational plaques outside a few of them, giving more of the history of neighborhood. There is a gift shop in the house next door to the birth home. ***If you want to tour the birth home of MLK, you must sign-up at the information desk at the Visitor Center. But don't hold your breath--they only take 15 people at a time so tours sell out quickly. The Visitor Center opened at 9 am and tours were sold out by 9:10 am on the day we were there. This is a common occurence. Because of the high demand, the NPS opens the house from 2-4pm on most afternoons for people to shuffle through on a shortened, self- guided tour. Expect to stand in line outside the house. The Visitor Center, Ebenezer Baptist Church, and the King Center are all open 9-5 everyday. The Birth Home is open for tours (must sign-up at Visitor Center) 10am- 2pm and open for a shorter, self-guided tour 2pm-4pm everyday. The biggest issue for visiting downtown Atlanta to me, is getting there. We planned our trip to arrive around 4pm on a Friday afternoon, hoping to beat the worst of the traffic. We were doing great until about 3:30pm when three wrecks happened in the last 10 miles into town, causing us to be delayed until 4:45pm. The Waze app and Google maps with current traffic are indispensable tools for driving anywhere in Atlanta. Always anticipate that traffic will add an hour on to your estimated driving time. Even leaving town on a Saturday was not easy heading north on I-75. I don't envy anyone that has to drive daily in Atlanta. The transportation page on the website for the park has a good description of the different options to get there. You'll find free parking at the parking lot on John Wesley Dobbs Ave (behind the Visitor Center) if you want to drive directly to the Park. MARTA. There are 2 bus routes that stop near the site and the nearest train station is King Memorial station, 1 mile away. See the website for details. Atlanta Streetcar. Opened in Dec 2014, the streetcar does a loop around downtown Atlanta, connecting the Martin Luther King National Historic Site to Centennial Park among other stops. Tickets cost $1 for anyone over 46" (only 2 free kids per adult) and the air-conditioned streetcars come by every 10-15 minutes. You can buy tickets with cash or credit card at the machine at each stop. *** We were excited to ride the new streetcar only to find that the ticket machine would not take our credit card (or cash from the other people at the stop). By the time we walked to the next stop to try its machine, the streetcar passed us and we decided not to wait 15 minutes for another one. The streetcar looks nice and would be an easy way to take a tour of downtown Atlanta. Hopefully we have more luck next time. Because of the issues buying streetcar tickets, we walked the 1.1 miles back to our hotel along Auburn Ave, then Luckie St. It is an urban walk, meaning we passed several groups of homeless people but we never felt unsafe. Along the way you pass through part of Georgia State University's campus, and the kids liked seeing all the big kids with backpacks. Woodruff Park and the International Peace Fountain is also along the way (see map of streetcar stops). There were lots of restaurants around Woodruff Park and in the Broad Street pedestrian plaza next to it. There is a playground here as well so it would be great place to stop for a lunch break with kids if you decided to walk. 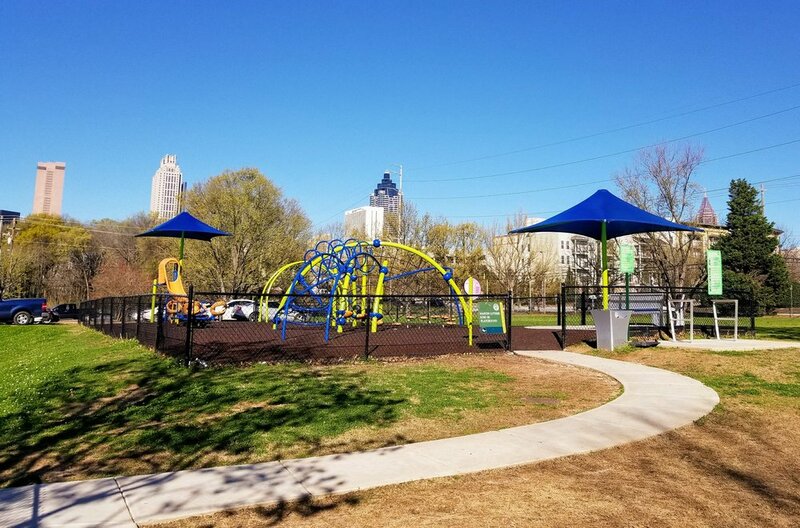 There are a number of hotels in downtown Atlanta, especially around Centennial Park and Peachtree Center, which are the areas I would look in. Use a clearing site such as booking.com, Expedia, or hotels.com to find the best rate. I used booking.com, and we ended up at the Hampton Inn & Suites Atlanta-Downtown. We had a suite for 6 people, included breakfast, and parking for one car for $268 total. The location was great, the breakfast was good, and the staff was nice. The room was a tad small when the pull-out couch was used, but it was doable and we would stay there again. 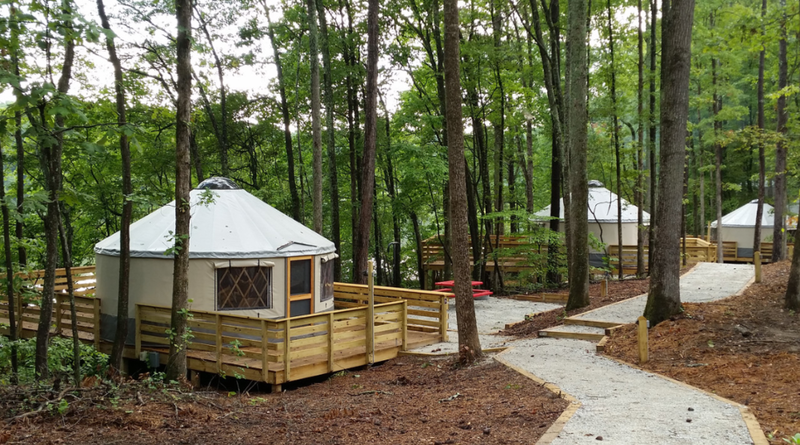 There are hundreds of cheaper hotels once you leave city center but if you are looking for something a little outside the box, look at glamping in a yurt at Sweetwater Creek State Park (30 min east of downtown) or at High Falls State Park (60 min south of downtown). Read this great write- up by AllTheRooms for more information about "The 5 Best Glamping Spots in Georgia". Image courtesy of High Falls State Park. Walk one block south of the Park to Edgewood Ave. There are quite a few bars, restaurants, and coffee shops around here. Try Edgewood Pizzeria for a "King" slice of pizza or Georgia Beer Garden for a sandwich, a huge selection of Georgia beers, and a fun outdoor beer garden. Sweet Auburn Curb Market. Walk east down Edgewood Ave and just after you pass under the interstate, you will see the Municipal Market sign on your left. Go inside and pick from "11 of the most popular eateries in the city." There is a stop for the Atlanta Streetcar outside. 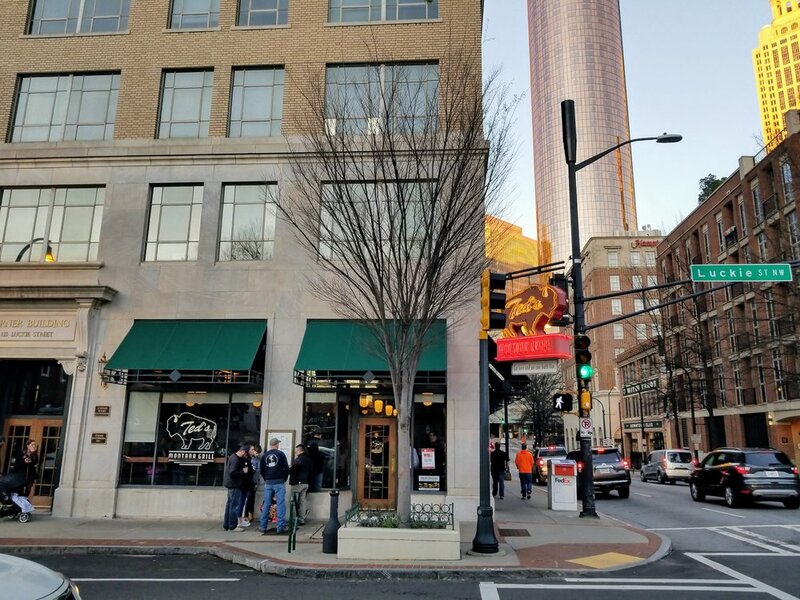 We stopped in Ted's Montana Grill on Luckie Street on our way to Philip's Arena, mostly because it was the restaurant closest to the Hampton Inn. It was very good though, and fairly priced for a more upscale place in downtown. The service was fantastic and my bison sliders were delicious. The kids' meals were also well done, ranging from $5 (grilled cheese)-$10 (salmon), including a side and a drink. They had local beers on draft as well. We would eat here again. Chick- fil- A. Next to the SkyView Atlanta (the giant ferris wheel), there is a Chick- fil- A inside a shipping container. No inside seating but it has a nice, covered outdoor area and the ferris wheel goes right overhead--free entertainment for the kiddos. Open 6:30am- 10pm Mon-Sat. The food court inside the CNN Center has all the fast food and fast casual restaurants you could want- Moe's, Starbucks, Chinese, burgers, etc. Ted's Montana Grill. You can just see the Hampton Inn in background on the right. All in all, we spent about 2.5 hours exploring Martin Luther King National Historic Park and its surroundings, and it was a great experience. You could spend even more time if you were able to tour the birth home or stayed to watch some of the video presentations at the Visitor Center. You could, however, also tailor your visit to about an hour if you were short on time. The kids I had with me (twin 8 year olds and a ten year old) enjoyed their visit, but I think kids of any age would find something to like, even if it was just sticking their hand in the reflecting pond around Martin Luther King's crypt. I would make a point to stop at this national park on your next trip to Atlanta.